The verb TO BE is the most important verb in English. Unfortunately, it is the most irregular verb in English, too. However, as all students of English manage to master its forms in the end, there is no reason to dispair. This mastery comes through practise. In this post I would like to share with you several several exercises and games in which your students can practise the verb. There are about 90 different sentences in which students should use the verb TO BE. The vocabulary is limited so that students with a vocabulary of 100 words will be able to do the exercises. In this post there is an infographic, a worksheet, an online quiz and two games. I hope it is enough and your students will learn the forms of the verb to be. 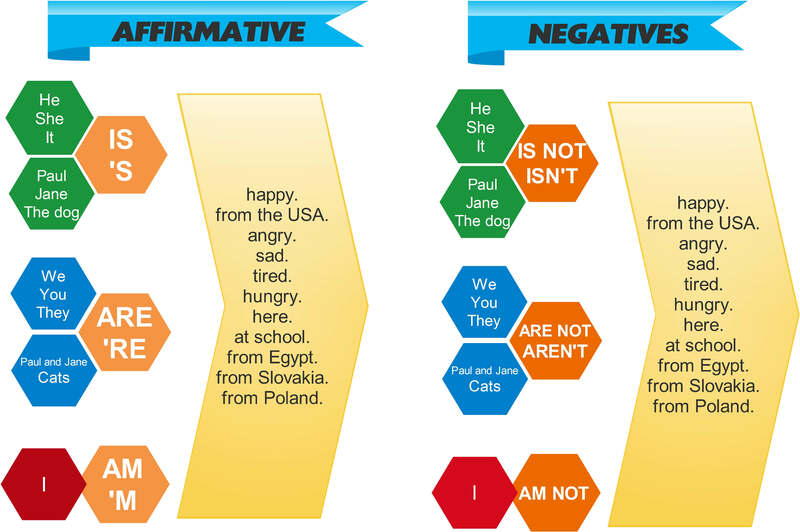 In the following infographic all the affirmative and negative forms are covered. The lower part gives a simple rule of thumb to help your students decide which form of the verb to be they should use. If you teach a monolingual group of elementary students it is a good idea to translate the second infographic. The following worksheet is nothing fancy. There are no sophisticated communicative activities or unusual exercises. There are six simple exercises to practise all the forms of the verb TO BE. The following quiz can help your students practise all the forms of the verb to beat home. The quiz consists of two parts. In the first part, students should match the beginnings and ends of the sentences and complete the sentences with the verb TO BE. In the second part, students have to put the verb TO BE into the correct form. The students will be rewarded with a game after each part of the quiz they pass. The quiz is in HTML5, so it will play on all desktops and mobile devices. The first game is called Penalty Shootout. In this game you should choose the correct form of the verb to be and then try to score a goal. Good luck. There are some great activities to practise the verb to be at British Council site. If your students do not know the adjectives used in this post, there is great song teaching the adjectives by my friend Jules from English Through Music Madrid.